There’s no denying it: Video Works! Use of video in email will more than double your click-thru rate. Webpages with video have a much better retention rate than those with just text and graphics. It’s clear we have become a video dependent culture. He’s got a great homemade logo and title for his video series: <2 with Jack Bailey. That’s less-than-2 minutes – the length of each video. He’s using a simple office background. It’s uncluttered, and does not distract. He’s using natural lighting. In other words – not using special lighting. He’s not using a microphone. Although the sound would be cleaner if he was using an exernal mic, he certainly can be heard and understood without. I know you can’t see it, but Jack is using a Cannon digital SLR camera on a tripod to record. Almost any digital camera you buy today will have video capability. Probably most important: he’s not reading a script. He’s simply presenting something he knows very well. Keep it short! Two minutes or less ensures that most people will stick with it to the end. Exceeding three minutes will greatly decrease the number. Be educational. Yes, there are times when you probably should tell your story, sell your system. But information (without obligation) is an item of value. The educational approach will build credibilty and recognition for you and your company. Plan what you are going to say, but don’t script it. Trust yourself! You talk about this stuff every day – you know it backwards and forwards. If you are going to get into something detailed, write it on a piece of paper taped to the tripod. Forget being slick and polished. That will actually work against you! Be natural. Be less than perfect. You’ll be communicating a genuine sincerity that will pay off big time. Don’t buy a lot of equipment. Stage your videos near a window so you can take advantage of natural light. Get a tripod. A whiteboard is great if you are going to use it. Any digital camera will do – even a good smartphone can be used to record. If you want to splurge somewhere, find an inexpensive lavalier microphone with enough cord to plug into your camera or phone. Do a little light editing. You will probably want to trim off the dead space at the beginning and end of the video. Adding a title on the front and contact information (and a logo) at the end is essential. Once you’ve worked with editing software a bit, you might want to put some words or numbers on the screen to emphasize what you’re saying. A good basic editor is Microsoft Movie Maker. It’s free and can be gotten here. There are lots of more sophisticated – and more expensive – programs available but Movie Maker will serve your needs for awhile. If you are an Apple person, IMovie works well. Jack tells me he spends about 15 minutes setting up and recording his videos. His assistant, Kay, will spend about twice that editing. Once the video is done, she uploads to Jack’s YouTube Channel (It’s a free and easy thing to set up) and then Boosts them on his Help-U-Sell Greensboro Facebook Business Page. $20 – $30 in boosting to a well defined target will produce thousands of impressions and hundreds of views. So, quit telling yourself you can’t do this! It’s not difficult. And it can make a big difference in our business! By the way, you can study Jack’s approach on his YouTube Channel. I’m an Open House freak in my Las Vegas neighborhood. Every time I see a directional, I make the turn and go see the house. 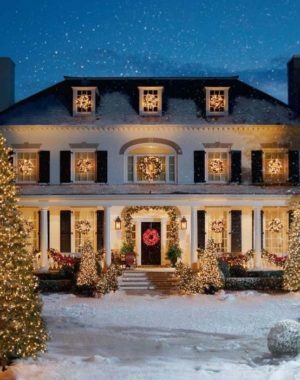 Of course I’m curious about the house – the floorplan, the decorating, the upgrade ideas. And I’m always checking the value compared to my own home (and thank goodness values have been skyrocketing in Vegas). But mostly, I’m checking out the agent. I want to see if they are skilled at getting my name and contact information, at qualifying me as a potential buyer or seller, at building the kind of rapport that leads to a working relationship. Poor signage. Three directionals do not a successful Open House make! Let’s talk 10 or better! Your traffic will improve and you will make a powerful impression on the neighborhood, one that may lead to another listing and another. Poor preparation. Usually it seems the agent just rushed in and didn’t have time to straighten up, freshen the air, put the dog out, empty the litter box and so on. Poor greeting at the door. That means a warm smile, a business card and, most important, the request for the visitor to sign in. No attempt to qualify the visitor as a buyer, seller, or a curious neighbor. The agents don’t seem to understand that they are there to make connections, build their database of potential sellers and buyers. No credible and valuable information about the area, the house, similar properties and so on. This weekend, I went to an Open House a block away from my home. Of course there were just 3 signs (and one of them had blown down). I got to the front door which was closed. I rang the bell and opened the door. Here came the agent, just off her chair in the back, wearing ripped jeans, and no shoes. Her toes were nicely painted, however. She introduced herself but offered no card (I couldn’t tell you her name or company if my life depended on it). And, she never asked who I was! Much less how to reach me via phone or email! She assumed I was a potential buyer (I think) but made no attempt to verify this by asking. When I got to the living room, here were the sellers, sprawled out on the sofa, looking bored, tired and not at all glad to see me. Are you getting the picture? Listen: here’s how you hold a great open house. Within 36 hours of the open house (that means a day before or an hour before), you go door to door around it, with flyers, inviting the neighbors (and probably picking up a listing lead or two). You prepare the sellers to have the place in top shape and to be GONE – unless they are holding the Open House themselves or assisting you. You arrive early and put out no fewer than 10 open house directional signs (David Bartels tells me this is the most important thing; so important that he pays someone $50 per open house to do it for him – and he puts out 15 signs). Yes, this will boost traffic, but the main reason you do it is to overwhelm the neighborhood. You’ve already gone door-to-door, probably sent out Just Listed cards, and now have your signs all over the place; you will have made a powerful impression. You greet people at the door with a warm smile, a business card and a clipboard. You ask them to please sign in before you step aside to allow them entry. Gene Manners is the absolute master at this. He gets contact information on pretty much everybody who shows up. His method? Present it like a normal business practice – it’s just the way we do it; be warm, friendly and confident. You ask: ‘what brings you in today?’ The answer will usually tell you if they are a potential buyer, seller, or just some dude like me who goes to open houses to evaluate agents. By the way, if I am asked – which I never am – I’d certainly describe myself that way. And I’d take the opportunity to talk about Help-U-Sell, too. You lead the tour and when they return to the front door you ask a qualifying or closing question: ‘So what do you think? Is this something you’d consider?’ No matter what they answer, you have the basis for a conversation here and an opportunity to either present other homes or close to write an offer. If it’s a neighbor or a potential seller, talk about their home value and close to do a Market Analysis. In short: don’t be a schlub! Take control and interact with people. Adopt the kind of playful attitude you might take at a Singles Bar: see how many names and numbers you can come away with! And then WORK them. I mentioned the one notable exception. I went to an Open House in a nearby neighborhood. The agent did everything right . . . ok, maybe she was a little skimpy with the signs, but other than that, she hit all of the high points I mentioned above. She met me with a smile and a card and asked me to sign in; then she asked why I was there. When I told her I was a nosey neighbor, you could almost see the gears shift. She asked about my house, it’s location, size, upgrades. She knew the neighborhood and the floorplan. She asked if I had some of the options that came with that model. Then she congratulated me for choosing a gated community. ‘In this part of town, that gate adds about $25,000 to your value,’ she said. Needless to say, I was impressed. And though that was last year, I still have her card. In my conversations with you, I’ve noticed an occasional quirk in the way you present the Help-U-Sell program to sellers. I call it a quirk – but it’s really a misunderstanding, one that can create problems for you. You don’t have three programs for the seller to choose from. * You have one; and it is FULL SERVICE, including MLS. We acknowledge that, even with FULL SERVICE, there are three ways your home could sell and each one comes with a different cost. We charge the seller at closing based on how the home actually sells. Your Set Fee is the same no matter how the home sells, so you don’t really care which way it goes (although we love it when there is no outside broker/agent involved because then the seller saves more and leaves the transaction very happy. Happy sellers are the most powerful part of our marketing). If a seller is willing to partipate aggressively in the marketing of the property (open houses, outreach to neighbors and co-workers, sharing on social media, etc) they may CHOOSE to stay out of the MLS, thus increasing their chances of saving the most. But it is a choice they make within your Full Service program. The message is: don’t over-complicate your listing consultation by forcing the seller to choose this program over that program over the other program. Present your program for what it is: Full Service with savings. Show the seller how s/he can save and how they can save the most. Then be what you are, a consultant, and help them make a good decision (choice). This is very important because it is one of the things that separates us from most of the new compeitiors who are emerging. These high tech/low touch offers are not designed for choice, not designed for consultation. It’s one size fits all and take-it-or- leave- it approach. The expertise that sellers seek is not there or not available to aid them in decision making. That’s your edge. You are HIGH TOUCH with technology. You bring human interaction to the process, helping home sellers understand what’s going on, and functioning as a trusted consultant. Today’s sellers have been trained to believe they have only one choice: go with a percentage based dinosaur who may or may not do the mechanical part of the process and advise them through it – OR – go with one of the new machines that only does the mechanical. YOU are the logical choice in the middle. You are the new way to sell your home and save, making ample use of existing technologies to get the job done while maintaining the personal, consulting posture that sellers need and want. Your task is the same as it has always been: Educate home owners in your Target Market that you are HERE, people use you, it works and they save thousands. *It’s ok to end a sentence with a preposition today. Look it up. It’s not my favorite form of syntax but if it aids in clear communication, I’m all for it. I think this is the funniest thing I’ve seen in awhile! 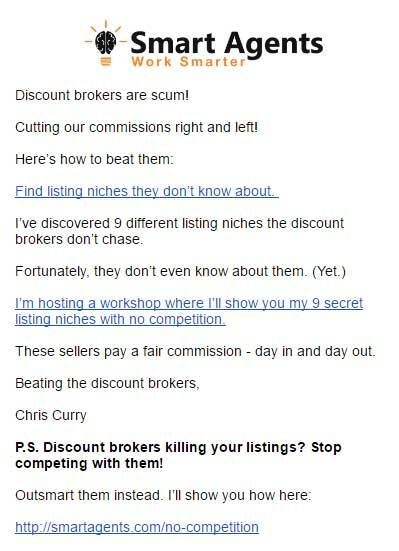 He’s talking about ‘Discount’ brokers, but he means Help-U-Sell (even though we are NOT a discount broker)*. But he’s saying the only way to compete with us is to go somewhere where we aren’t! The only way to beat us is to go somewhere else! There is nothing fair about percentage based commissions. 6% of your home’s value is obscene, sure, but even 2% would be unfair! What does a percentage of your home’s value have to do with what it takes to get it sold? (Absolutely Nothing!) And, if your real estate broker is charging a percentage, that mean the person with the less expensive home is going to pay LESS than you for the exact same service! There’s NOTHING fair about that! Listen: the ordinary real estate world runs on a business model that hasn’t changed in 70 years. It’s old and stale and consumers are rapidly figuring that out. One thing this 21st Century has shown us is that consumers will quickly jump to anything they perceive to be faster, better, more modern or more logical. Consider the rise of Amazon and the decline of Macys, J C Penney and Sears. Faster, better, more modern, more logical: that pretty well describes Help-U-Sell Real Estate, except that you can also add in Less Expensive! *A discounter finds ways to cut the expense associated with providing goods or services. They might use less expensive material or provide fewer customer service personnel. In real estate, a discounter would cut something – and it would probably be marketing and service. That’s not Help-U-Sell. We charge less because our business model is different: it is modern and efficient. Our sellers get all of the marketing and personal service ordinary brokers deliver and actually more . . . they just pay less.